I mentioned the legal Bates v Post Office class action (more correctly known as Group Litigation Order or GLO) last week. 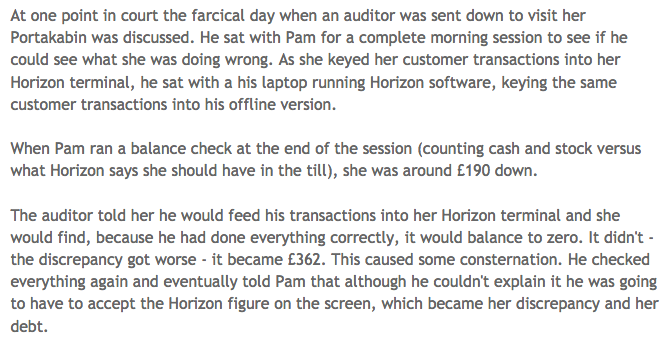 This is the case where former subpostmasters who have been sacked and/or charged and/or jailed for theft, fraud or improper accounting are claiming that the errors revealed by the Horizon computer system and audits were all due to errors within the system, and that there was no fraudulent activity. 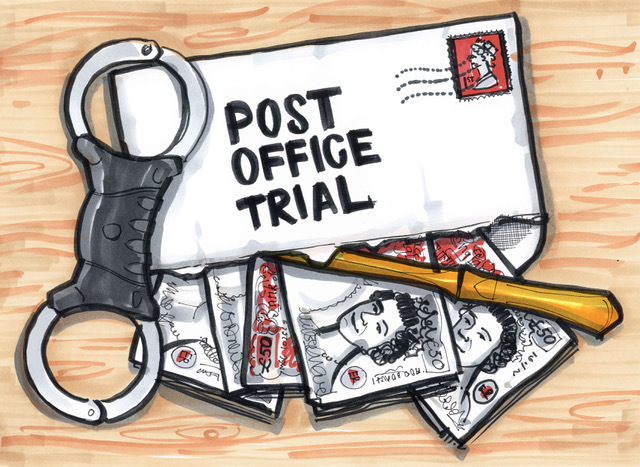 I hope some of you have had time to read Nick Wallis's reports on www.postofficetrial.com or his twitter feed. You don't have to join Twitter to read the live reporting: you can read it here, and if you enjoy courtroom drama and cross examination it is the closest you'll get to hearing it on the radio or tv! If you don't have time to read it 'live' a summary is reported on the website, where you can also find links to the morning and afternoon twitter feeds in a better format, and there are also links to documents presented in evidence, including the witness statements and some internal Post Office documents including some in which errors within the system were acknowledged. Even when auditors worked with subpostmasters errors occurred, and were compounded! This is the first of three trials, and centres around the relationship between subpostmasters and POLtd. Subpostmasters (SPM) are not employees, they are 'contractors', 'agents' or franchisees. Most of them take over an existing branch. So far all the witnesses have alleged that they did not see the SPM contract before starting the job: Post Office QCs fight this based on the incredulity principle - it is barely credible that anybody would take on such an undertaking without seeing the contract. Crucially POL haven't been able to produce any signed contracts from these people. Given that the contract is 144 pages long, you would think that they would have remembered it, no matter how large the pile of papers passed about. Another factor is that when the new SPM takes over the branch is still 'live' and serving customers. You can really only be trained in what happens with these customers' transactions unless there are quite spells when other things can be covered. It all seems very unsatisfactory, and reminds me of 'sitting with Nellie' which is how office jobs were learned when I left school. The next trial will cover the Horizon system itself. The final trial will, I think, take each individual claimant's evidence and determine who is right and who is wrong and what any liability may be. The judge is being hard on the PO QC when he makes assertions not backed up by the evidence, but equally he is being firm with witnesses who want to make long points rather than answering the specific question. The latest witness has interrupted the PO QC when he hasn't been allowed to complete his answer. It has been quite entertaining reading.